Being a child is the most important time for brain development. Encourage your little one to explore, innovate and create through the power of hands-on learning. Luvlybubbly’s fun fashion parties promote self-expression; giving them all the tools and training they need to design their very own clothing which they can strut on the catwalk afterwards. Or, you know, take to the red carpet with masculine flavour! Our parties don’t only teach children new skills, but encourage more self-confidence than ever before too. We arrive at your venue 30 – 40 minutes prior to the party to ensure our team have everything set up, ready for all your guests to have a fabulous fashion party experience. We shoulder the pressure, our team will do it all... Relax! At the beginning of a party, a selection of design templates will be emailed to you 3 weeks before the party so children can view and select from over 25 design options. On the day they’ll be spoilt for choice from our wide range of sparkly rhinestones to choose from. This is a fantastic opportunity for children to be the sole designer turning a boring uninterested T- shirt into something quite spectacular. The end results are truly amazing! To aid with inspiring our party guests we display rhinestone T- shirts created by our previous Luvlybubbly designers. First, the children are shown the step-by-step art of tutu making, whilst the children are creating their tutus our team member will heat press their T-shirts so our budding artist can wear their creations. 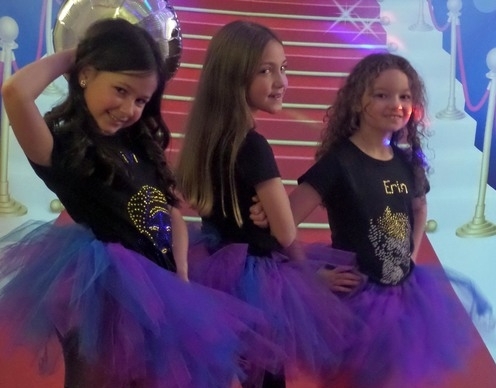 Once the tutus are completed and all the T-shirts are ready girls change into their designer outfits and are extremely excited and eager to proudly showcase their finished masterpieces! Part 3: Get Ready for the Show! Our team roll out the celebrity red carpet with the matching backdrop enhanced with music and flashing lights, the scene is created for each guest to strut down the catwalk modeling their creation. Each guest is provided with their own designer outfit in a LuvlyBubbly party bag and a certificate of achievement- for amazing effort and a new learnt skill.